Let's face it. Firefighting is dangerous. Injuries and loss of life come with the territory. It's what we do. Be prepared. Be ready. Identify yourself. Wear the Bravest ID. fireground and while responding to a call for help. Bravest ID is built for firefighters. It is 100 percent Made in the USA. It is great looking, rugged and most of all, reliable. 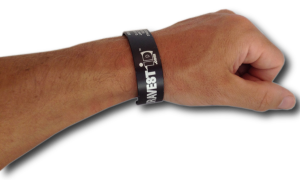 Your six lines of information are permanently laser engraved into our hard anodized aircraft grade aluminum bracelet, ensuring it will be readable for years to come. What does this mean? It means that you will be identified. Your information will be accessible to medical personnel - no matter what. Wear the Bravest ID on the job. Wear the Bravest ID in the firehouse. Wear the Bravest ID because it looks good. Wear the Bravest ID because it makes a statement about your lifestyle - your willingness to put your life on the line to help others.